Royal Enfield’s Classic has been an insane seller. Despite its higher price tag it outsells a lot of much-lower priced motorcycles. But things have started to change and it has seen a steady and consistent decline in the last few months. Recently, it received a dual channel ABS unit and hence it is eligible for sale after the ABS-deadline of 31st March 2019. 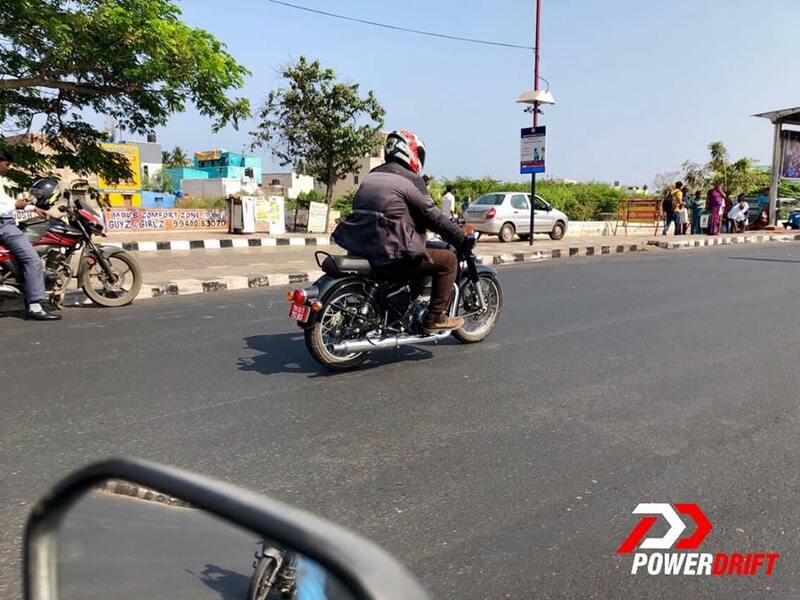 However, a mysterious Classic mule has been snapped testing somewhere in Chennai (credit Powerdrift) and it is carrying some interesting changes. Let us list what we can decipher.. 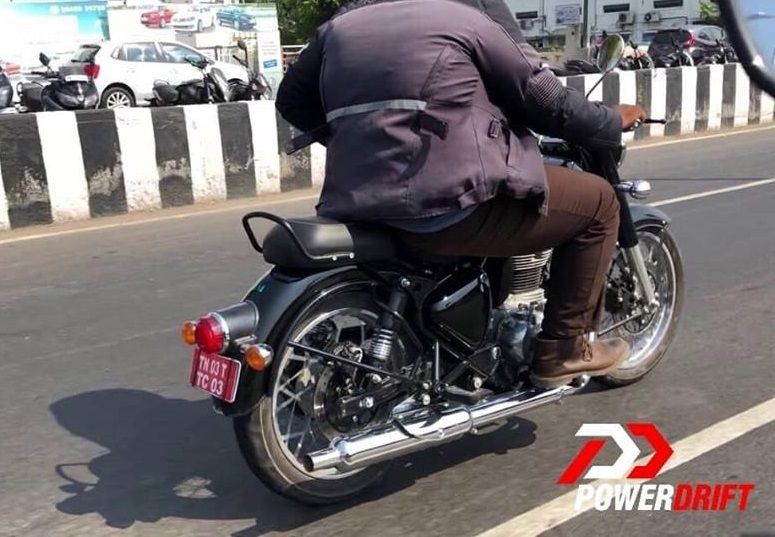 Shorter Exhaust: The exhaust canister on the current model is huge and frankly, it is not known why is it so big that it juts out the length of the motorcycle! This test mule carries a shorter exhaust system, which may suggest that this update may have to do with the upcoming BSVI emission norms (however, it is not a confirmation yet!). Discs on the Other Side – Both the front as well as the rear disc brakes are now moved to the right side of the motorcycle. This has resulted in the chain to shift to the left side of the engine. Different Rear Shocks – The gas-charged shock absorbers have also been changed and they have a slightly bigger spring cover – may be to provide a more retro look. Raised Grab rail – The rear seat has rounded edges and the grab rail is slightly raised. Tail Lamp – The tail lamp is a fresher unit with chrome outline. It may be an LED unit as well. The motorcycle may be running without a kick starter, however, it can not be confirmed. More details about this spotting and RE’s plans will get clearer in the times to come. For now, we do not think this update is coming to us anytime very soon!